My sister Maria was listening, too. “I have zebras in my head, too,” she commented. “I think zebras run in the family,” I theorized, and then I added darkly. “I should probably just paint black and white stripes on my forehead to let everyone know.” I used my index finger to paint stripes on my forehead, then started to do a Travolta-ish move to make them cooler, now using both hands. I like to joke about my chronic hypochondria, because it’s a way of trying to get the upper hand over it. I always hope that by laughing at it, I can beat it into submission, at least temporarily. It’s a bit ironic to have a “disease” that consists of believing I constantly have other diseases, and feeling intense stress and anxiety over that belief. It’s something I’ve lived with since I was 6 years old, or at least that’s the earliest I remember feeling hypochondria; I’d lie away in bed at night crying because I thought I was dying of cancer. And over the years, I panicked at the various chills, twinges, twitches and pains that turned out to be part of normal life yet made my life anything but normal by my extreme reactions to them. I guess it’s like looking at someone with depression and saying, “Snap out of it!” and then assuming they like being depressed when they can’t just snap. It’s fundamentally human to judge someone based on our OWN responses and our OWN abilities. Because it’s impossible to get into someone else’s brain and feel how they feel, it’s simpler to reduce the equation to something like “She just isn’t trying hard enough,” or “she wants attention,” or “she must just like feeling that way.” This also gives us reprieve from the uneasy possibility that some things are not easily controllable, and that life sometimes hands us things that can’t be fully conquered. It’s more comfortable to dismiss someone’s struggles by minimizing them to self-control issues; that way, we assure ourselves, that person’s problem could never happen to US because WE have the self-control to beat it. Of course there are things that help chronic anxiety. Exercise helps; clean eating helps; talking helps; friendship helps; therapy helps; medicine helps. I’ve engaged in various combinations of these for years, and found that for me, laughter is really one of the very best helpers. And, for the record, I DO enjoy life – heartily, fully, with open arms, with joy. It’s just that I also have these intense moments of…un-enjoyment. Laughter is awesome. When I laugh at a joke, I forget all of my troubles for a split second; I earn a blink of respite from worry; my soul unwinds and relaxes for an instant. And all of these instants add up, I believe, into something necessary for my psyche - just like the rests between each beat of my heart allow it to keep beating for a lifetime. I need the laughter breaks to keep myself sane and focused and able to keep going on with life despite the various aches and strains that turn my brain into a special kind of funhouse of panic. This may be why I like puns and dirty jokes and clean jokes, why I enjoy finding ugly things in thrift shops with my sisters, why meeting weird people is AWESOME for me, why I love sarcasm and old SNL skits and Augusten Burroughs, and why laughter is just a big part of my life. “Laughter is the best medicine” has been an adage for a century, and scientists have been researching the chemical effects of laughter on the brain and on the body’s ability to fight disease and reduce recovery time. Researchers William F. Fry, M.D. and Michael Miller, M.D., found that mirthful laughter can temporarily improve vascular health (they believe it temporarily reduces blood pressure due to the release of nitric oxide during laughter; internally released nitric oxide is believed to function in the vascular system as a vasodilator, relaxing blood vessels and consequently reducing blood pressure). Other research found that mirthful laughter can increase the activity of “natural killer” (NK) lymphocytes in the body. This could mean that unforced laughter at humorous things can, over time, improve a person’s immune function in regards to fighting serious illnesses like cancer as well as diseases like the flu. Laughter functions like exercise, in a way – it increase heart rate and blood flow, as well as engaging various muscle groups in contractions and expansions. It’s believed to release endorphins, otherwise known as the “feel good” chemicals of the brain. And who doesn’t want more “feel good” chemical, especially one that’s legal AND made right in your own body? That’s pretty damn cool, if you ask me! I know that everybody has their own zebras. 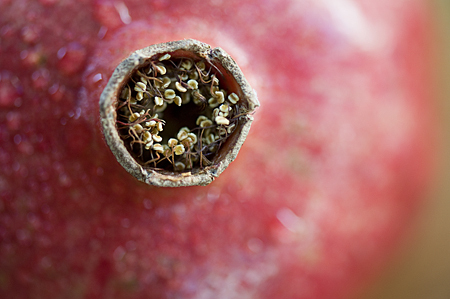 You may not worry about having an illness, but usually there’s something causing anxiety and stress in your life: Maybe it’s a REAL illness, not an imagined one; maybe it’s work, family, politics, money, a large roach in the hallway, or a bottle of tequila that crashed onto the floor when you angrily tried to pull a bag of frozen salmon from the fridge (true story, BTW). These things may not be funny (except for the tequila part) or wonderful (except for the part where the tequila actually made the tile grout SUPER clean where it spilled!) But there will be funny things in your life, things that you happen upon or things that you seek out. Find these things and enjoy some laughter. The zebras are coming, but laughter weakens the damn things, so laugh with me. Enjoy what you can! I know that you surely do laugh; everyone does. But try to laugh MORE. Laugh right now – think of a good joke, Google something silly, call a friend, whatever works for you – but add in some laughter this minute. Your body and mind will thank you. P.S. : And whatever you do, do NOT find and read article like this one, entitled “In Oncology, Hoofbeats Are Nearly Always From Zebras” written by Miranda Fielding, M.D. 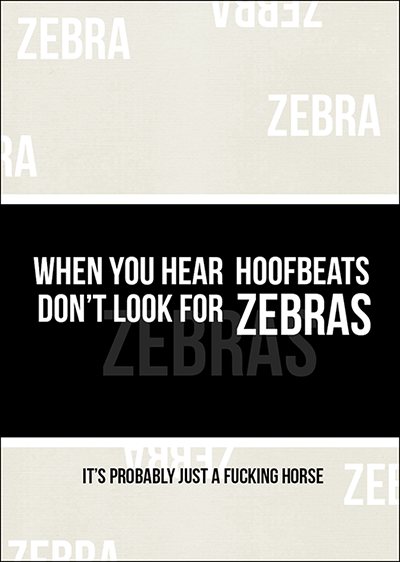 or this one, “Sometimes When You Hear Hoofbeats, It Could Be A Zebra” by Burton et. al. because these articles, while certainly informative, are not going to help you focus on the fact that probably? In your life? Horse, not zebra. P.P.S. – If you haven’t yet read it, the book Catch 22 by Joseph Heller is VERY funny. P3S: As a general FYI, tequila IS a wonderful tile cleanser, once you are able to remove a)All broken glass from the vicinity, b)Your dog, who is trying to lap up the spill, c)Your daughter, who is screaming, “Did it get on Seahorse!? Is Seahorse OK! ?” d)Your rage at whomever left the bottle sort of interlocked with the bag of salmon, probably yourself, to be honest, AND e)Your shoes, which now smell like a frat house floor. Good times!